Greta Van Fleet have been receiving a lot of attention globally since releasing their debut EP “Black Smoke Rising” in April last year. 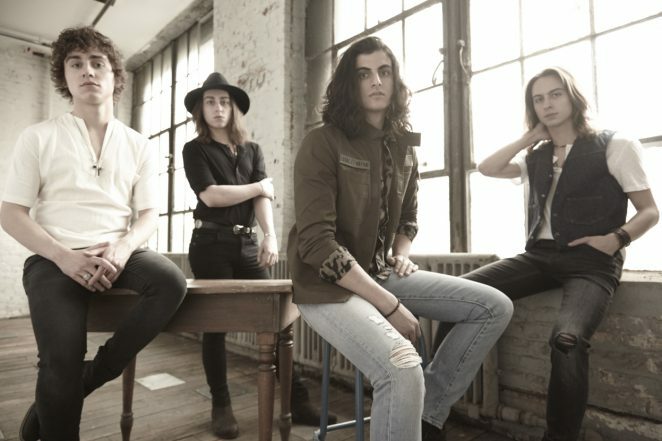 The Michigan-based four-piece, consisting of brothers Josh, Jake and Sam Kiszka alongside their high school friend Danny Wagner, have gained a strong reputation in America and Europe for their obvious classic rock influence, calling back to the music of Cream, The Who, AC/DC and of course, Led Zeppelin. Some people have criticized their sound for being too derivative, while others have embraced them as a commercially successful rock band in a time where the airwaves are dominated by hip-hop and techno. Now they’re gearing up for the release of their first full-length album later this year. The first single “When The Curtain Falls” has just been released, and is sure to please fans of old school Rock & Roll while providing a teaser of what’s yet to come. Joshua Batten was given the chance to speak to Greta Van Fleet guitarist Jake Kiszka about the single, the album and his unique choice of guitars and amplifiers. Hey Jake – thanks for taking the time to speak to me. You have just released “When the Curtain Falls”, the first single from your upcoming debut album. Tell me a bit about how this song came about. Initially it started with the riff itself – that had kinda been around for a while – and then it was a pretty quick process to put it together when I brought the arrangement to the guys. It was pretty instantaneous – as soon as I played through it, everybody knew what they wanted to do, and we tracked it in about 15 minutes or so. 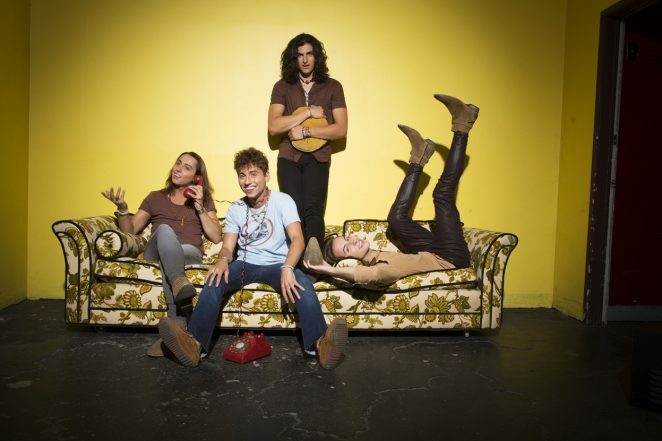 Would you say that spontaneity is a bit part of the Greta Van Fleet sound and work ethic? Yeah, I think so. We try and work with the idea of “we haven’t done this before”, so it’s a constant form of spreading out and trying to write in terms of different emotions and executing different objectives. As far as spontaneity goes, a lot of it is a very natural process because of the four of us contributing to the overall sound. So there’s natural continuity in the sense that we sound the way we do, and then there’s continuity in the songs based on our ambition to stretch out. You worked with producers Marlon Young and Al Sutton again on this track – what do they bring to the table as producers that you can’t do yourselves? I think it’s more of an informative thing in terms of learning to be studio musicians. Very early on, we were putting out records when Sam and Daniel were 16-17 and Josh and I were 19-20, we knew nothing about the studio right off the bat. So they taught us how to be a bit more studio-savvy. A lot of what they bring to the table is their ability to help us translate what we’re going for. They possess a lot of knowledge and wisdom in that world, and I’d hope to think we’ve learned a lot from them. Tell us a bit about the new album – what are you going to be doing to distinguish it from your first two EP’s? What we kind of set out to was cover more ground, and having the ability to finally put together a full structure with our first full-length album is pretty exciting in itself. That excitement has started driving a lot of new material, and I think that what we kind of want to do is showcase where we’re at now in terms of our capabilities as musicians and songwriters. I’d say about 50% of the material that’s going to be on the actual album was written during the recording process. Some nights we’d go home and write stuff then bring it to the studio, and Marlon and Al would lead. If we had been writing something, they would make us demo it, and then we’d come in the next day and there’d be a whole new song. There are some similarities as well to the past EP’s, in that some of the material stems from three or four years ago up to the most contemporary material that we have. So it’s kind of a mixture of that, and it’s all kind of accomplishing the same thing as the EP’s, but on a larger scale. There’s versatility in the way that it flows and a lot of dimensions as you go through it and listen. Tell me about your journey as a guitarist – who taught you how to play, and what drew you to the instrument? My earliest influence was my father. I grew up in a household where there was a lot of creative outlets – film, literature, poetry and music. There was always music lying around, and dad would play us stuff like Woody Guthrie, so I kind of picked it up early on. I was 3 years old when I started playing, and from that point it was kind of a pastime – I don’t think I ever would have viewed it as a serious thing then as I do now. But there are experiences throughout life that sort of change or navigate who you are and what defines you. I was sitting on the ground next to my dad watching a Cream documentary, and I saw Clapton play – that was one of those defining points, where I said “Someday I want to do that”. All of those influences – Angus Young, Pete Townsend – they’re all about constantly trying to evolve, doing things that have never been done and screwing around with all these possibilities. I think there’s still a lot of ground to be covered as far as guitar work and skill, so now it’s so much a part of who I am, and something that’s always been there. Let’s talk guitars – what did you play growing up and what’s the story behind the 1961 Gibson Les Paul SG you use at the moment? My very first guitar was a little Squier Stratocaster, because I wanted to be Jimi Hendrix, and my first ‘real’ guitar after that was a Gibson SG. That was something I chose pretty early on when I was about 12 and I’ve stuck with it ever since, so there’s an element of familiarity and comfort and I feel like it defines me as a guitarist with that sound. As for the ‘61 Les Paul, about a year and a half ago I was hanging around at Chicago Music Exchange and I was speaking to the CEO, Andrew Yonke. It was the very first time I’d walked into the store, and he asked me “What kind of guitars do you like?” and I wasn’t entirely sure how to respond to that, so I said “Well, I kind of like SG’s and I kind of like Les Paul’s as well, but I’m just a very big fan of guitars” and he said “Good answer.” So, he took me upstairs to his vault, and he pulled out a ’61 Les Paul, which has an SG body shape, PAF pickups and a very light body. He handed it to me and said “Take this and play it”, then we went back to his apartment and I was jamming on it for a while, until eventually he said “Go on with it. It’s yours.” So that’s how I received that guitar, and I’ve since acquired another 1961 as well, but playing it and hitting those first chords going through a Marshall rig that was set up, it was very instantaneous and I knew that that was the guitar that was going to give me what I needed to achieve tonally. And what’s that guitar going into? Amps/pedals? That’s another interesting story – I also acquired an amp from Chicago Music Exchange called a Marshall Astoria. Originally there were three colours – Blue, Red and Green – but basically Chicago Music Exchange went to Marshall and said “Take all of the good properties of these three and make a Marshall Astoria in Black & Gold”, so I was playing through that amplifier, and that was another defining moment where it was like “Well, this is another utility”. I now run through the Astoria with minimal pedals as I don’t find pedals to be that necessary to be able to get how I want to speak through the instrument, and I can emulate a lot of pedals just by doing certain things. I do have a Holy Grail reverb pedal, a wah-wah pedal, a preamp boosting pedal and a Jext Telez fuzz face. What’s it like having the opportunity to travel across America and Europe playing this music with your brothers and your best mate? I think very early on, I wanted to put a group together, and I never thought it would be with Josh, Sam and Danny. Often many times throughout history it’s based on common interests and the fact you’ve kind of grown up together and shared a lot of the same life experiences as well as musical influences. It’s really exciting – you kind of grow out of a household and go off and separate from your brothers, not necessarily with the best relationships, but we came out of the same household and have just stuck together. That’s a whole other fascinating side subject when it comes to being able to get along or not. Sometimes you can, sometimes you can’t. There’s definitely benefactors to being together and being brothers and there’s definitely downsides, but ultimately, it’s like we’ve grown pretty close to each other interestingly enough. And there’s this sense of dependability on each other because we’re all in a band and we all have to contribute towards creating this music and travelling together. Because we have that construct, I think we’ve grown a lot closer together and we’ve learned to respect each other more and give each other space. And are we going to see Greta Van Fleet in Australia any time soon? We’re working on it, but that’s all I can say for now.